The Vegan Magpie: Tesco Offers Everywhere! Hello! Tesco are have a massive 'free from' offer going on at the moment. All of their own free from items (that I can see!) are on 3 for 2. This includes (but is certainly not limited to) delicious items such as their new vegan cheeses, new millionaires pudding and new cheesecakes! It also includes frozen products such as their ice cream cones and Magnum style ice creams, as well as store cupboard essentials like their salad cream. The offer lasts until 16th May, woohoo! 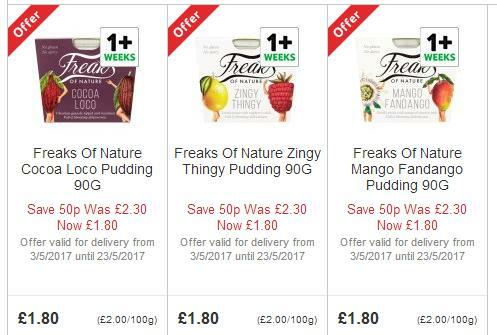 Not only that, but they also currently have the new and quite popular Freaks of Nature puddings on offer, was £2.30, now £1.30. Whilst this is still a little expensive, now would be a good time to try them if you like the sound of them! Valid until 23rd May. NOT ONLY THAT! 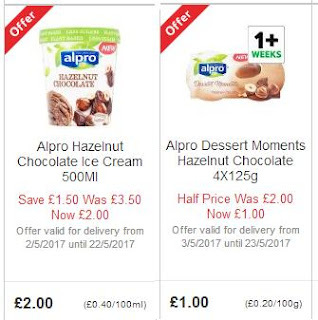 But Tesco are also currently running a lot of offers on Alpro products, including dessert moments half price, was £2.00, now £1.00, yoghurt offers making them only £1.00 and fresh milks only £1.00! Valid until 23rd May. PLUS! Alpro ice creams are just £2.00 until 22nd May. They also have some other great deals, but these felt like they were the best, particularly as they feature some new and exciting products. The Vegan Kind sheese offer!